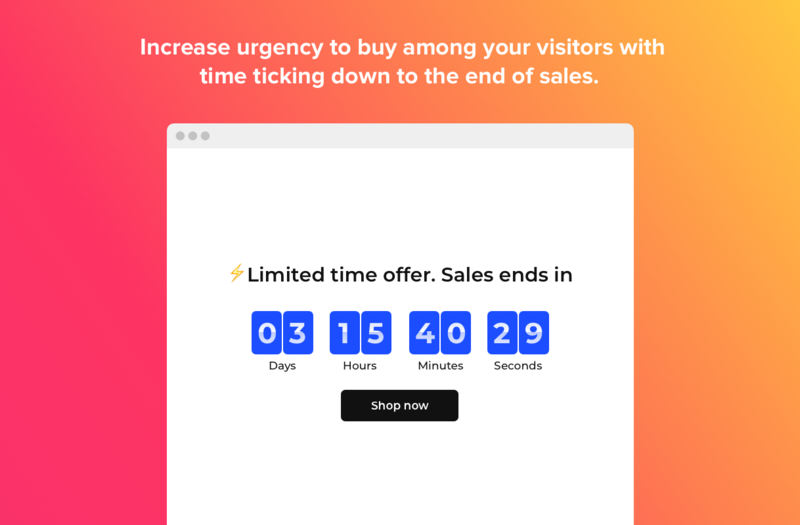 Create sales-generating timers for your website with Elfsight Countdown plugin. Heat up the atmosphere and create a feeling of scarcity for your items, showing how they get sold out right before the clients’ eyes. Increase urgency for purchase with time ticking down to the finish of the special offer period. Draw attention to your upcoming events and keep your audience eagerly waiting for the start with countdown clock for WordPress. 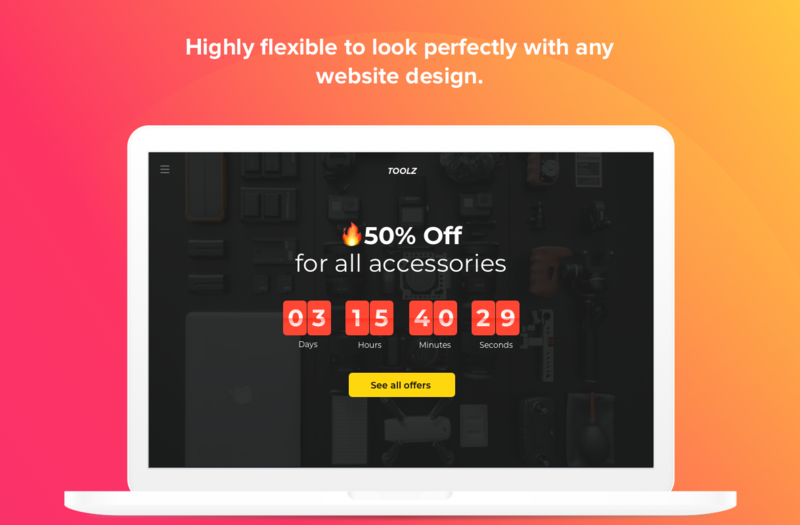 It’s easy to configure a custom countdown plugin, that will be ticking down time to the end of a special offer of discount period. It will help you cause a feeling of urgency among website visitors and stimulate them to buy. Drive your clients to make a positive buying decision faster with a personal countdown timer for each visitor. It will show the time left till the end of their personal offer, discount, or bonus and speed up sales. 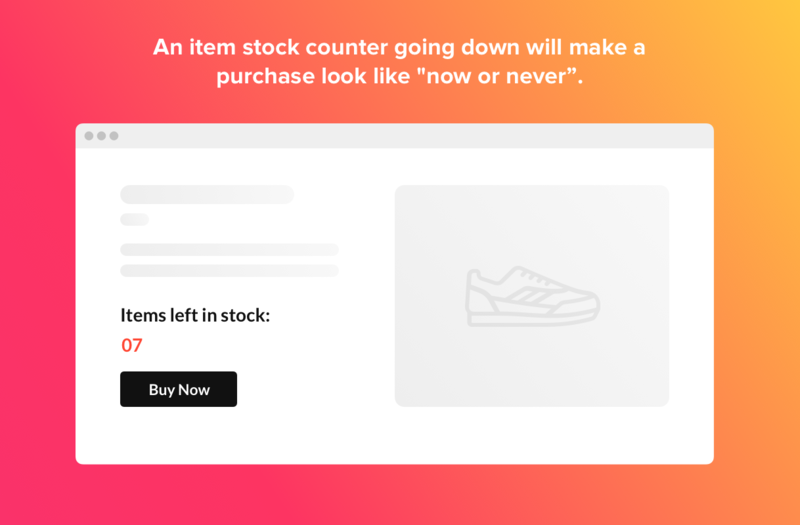 With a custom counter you can create an impression of scarcity: item stock is going down right in front of customers’ eyes and the number of clients viewing the item is increasing. Just set the starting and finishing numbers to set it working and the timer is ready to go. There are two variants of action after the timer is finished. You can choose the timer to disappear from the page, or it can be replaced by a message that you will come up with. Your Countdown Clock can be set for any duration of time, with the help of different time units. They include days, hours, minutes, and seconds. Thus you can, for example, turn а year into 365 days, or 2 days in 48 hours. You can show all units or hide those you don’t use in your timer. 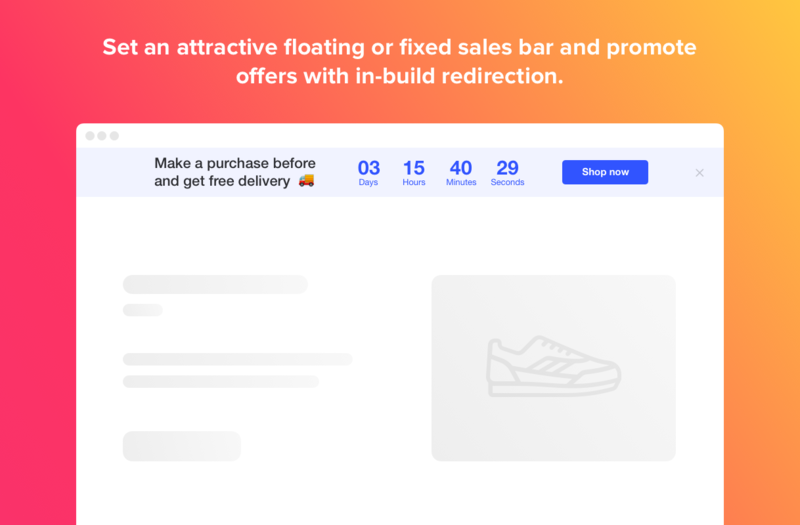 Create a call-to-action, which will build up urgency, make your visitors excited and push them to shop on your website right now. For this use a message above the Countdown widget, simply create and type the text and it will show on the page. Add a button under the Countdown Timer, that will direct customers to a purchase page or to any other page you set. Don’t let a single user miss a purchase and shorten the buying journey. You can also edit button label and enter the one that will sound encouraging. 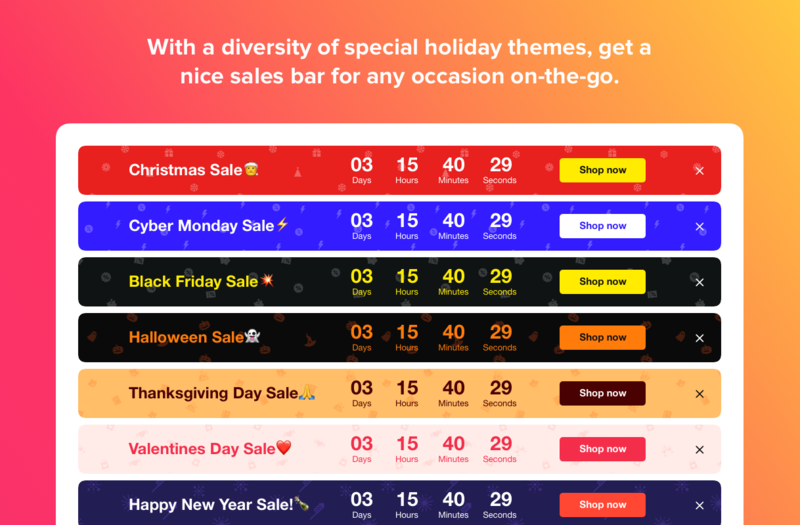 With theme sales bars for holiday sales and special offers, you will keep your website in the mood and attract shoppers. Use one of the predefined themes: Christmas, New Year, Black Friday, Valentine’s and more. Keep a celebration atmosphere to attract sales. You are free to choose between different variants of Countdown plugin position. Set a static bar on the header of the page, create a floating top or bottom bar, or choose a custom position on the page, in this case you can also align the widget center, left, or right. To make your perfect widget, you can set the size of the clock and the button independently. Set them the same size or scale them differently. For both elements, there are handy scroll bars which make finding the right size easy. Five embedded style templates help you create a Countdown Timer that will fit into your WordPress website and reflect its design concept. Each of them is applied just in one click and you can try them all to decide which is yours. In our widget there are four elements for which you can choose your custom colors timer, button, timer labels and message text. Choose your own color to get a unique look. We want our WordPress Countdown plugin to suit every need of yours and your visitors. That’s why it perfectly works on any device, including tablets and smartphones and with any display resolution. After creation of a widget of the plugin, you will get its shortcode. You can use it as a common WordPress shortcode, for example, add it to the page. Our Countdown Clock plugin has Visual Composer element of approved page builders to make it handy for you to work with the plugin if you use the builder. 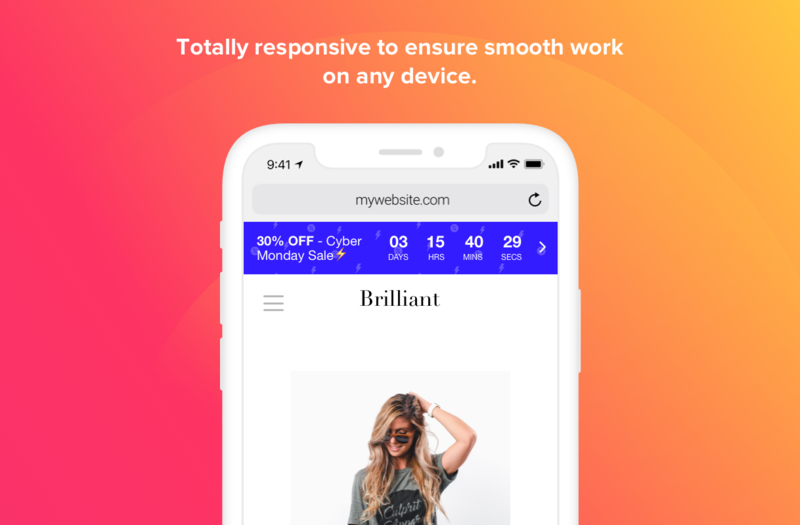 You can easily add Elfsight Countdown Timer plugin to any WordPress sidebar or footer of your website for better user experience. Upload setup zip to your website. IMPORTANT! At this stage, make sure you upload not a full item zip, but just WordPress installable zip. Create a new widget then customize it using Live Widget Editor. Simply copy and paste the shortcode of the widget to the preferred page of your website. Congratulations! Now the Countdown Clock plugin is up and running! Have doubts or need help? Then just start a ticket in Support Center at https://elfsight.ticksy.com/ and we will be back with professional help quickly. Expect our response Mon – Fri from 10am to 7pm CET. We are open to our customers and aim at getting better! We are a close-knit and highly trusted team of full-time developers with 10-year experience. Sharing the same goals and putting our best knowledge into what we do make us successful. One of our priorities is bringing the of satisfaction with our products to our clients! That’s why you can always rely on us! Our Countdown plugin for WordPress doesn’t work properly on your website? Report your issue or bug by describing it in details and send us a link to your website. We’ll do our best to find a solution. We release new updates and features on a regular basis. Just check for the fresh version in WordPress admin panel. We are always open to your ideas. If you require some specific features, which might as well improve our products, then just drop us a line. We will consider embedding them in the future updates. We don’t provide setup services for our plugin setup services. However, we’re happy to offer you installation guides. And if any errors come up during installation, feel free to contact us. If you still would like installation to be fulfilled by a professional, you can contact specialists from Envato Studio. We don’t offer plugin customization services. If you would like to adjust the way some features are represented, share your ideas with us, and we will take them into account for future updates. If you need it right now, feel free to contact Envato Studio for customization services. We don’t fix bugs or issues of other plugins and themes, developed by third party developers. Also we don’t offer integration services for 3rd-party plugins and themes. You can always contact us at https://elfsight.com/feedback/ and share your feedback. In case there’s something you would like to change in the WordPress Countdown plugin, we will be glad to hear your suggestions. The most requested features will be included into new updates to make our clients satisfied and help them achieve their aims. Still haven’t checked our plugin live? Do it right now on the WordPress Countdown Timer page!